Friday, November 2nd at 8:30 am in the church, 11 am outside near the Columbarium followed by a luncheon in the Family Life Center and at 7 pm (español) in the church. What’s the difference between All Saints’ Day and All Souls Day? All Saints’ Day is a day Catholics offer prayers to those in purgatory. Reverend Donohoe said, “All Saints’ Day and All Souls’ Day are related, but they are two separate celebrations. 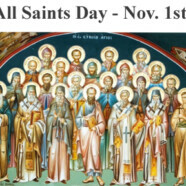 On All Saints’ Day there’s a call to live as saints, to remind us how we’re supposed to live. On All Souls’ Day, we’re talking about all souls and asking God’s mercy for them. “We’re talking about those people who have died before us, and their process of getting to heaven, through Christ … It has its roots all the way back to the fourth century.” It is on this day that the Book of the Dead is opened to allow parishioners to write the names of relatives to be remembered. All Souls’ Day is a commemoration of the faithfully departed and is observed primarily in the Catholic Church. Its origins date back to European folklore related to customs of veneration practiced worldwide through evens like the Mexican Day of the Dead (Dia de los Muertos) or the Chinese Ghost Festival.